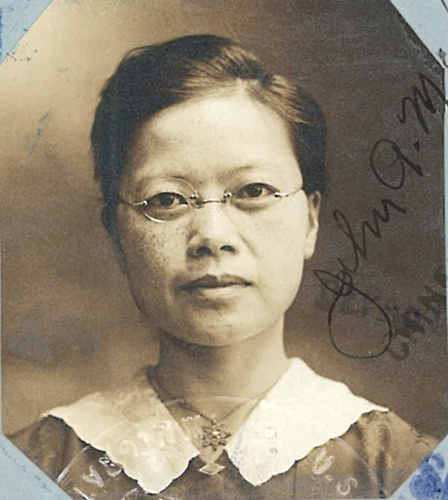 “Photo of Senn Pauline Poy Ling,” 1918, Chinese Exclusion Act case files, RG 85, National Archives-Seattle, Senn Pauline Poy Ling case file, Seattle, Box 394, 7028/978. Miss Senn was born on 21 March 1882 in Shin Hing, China. She first came to the United States in 1896 as a young student. She attended various schools including Baptist Mission Training School in Chicago, Illinois; Home Mission Society in Portland, Oregon; McMinnville School, McMinnville, Oregon; Adelphi College in Seattle, Washington; and Lewis Institute in Chicago. She obtained her B. S. degree from Northwestern University, Chicago, Illinois in 1916. When she wasn’t going to school, she taught at mission schools. Senn returned to China in 1918 and was a missionary/teacher at the Girls’ School for the South China Mission. Miss Senn’s witnesses on her 1918 application were Shailer Matthews, Dean of the Divinity School of the University of Chicago and Miss Nellie G. Prescott, Foreign Secretary Woman’s American Baptist Foreign Mission Society of Boston, Massachusetts. Senn came back to the U.S. in 1924 and received her M. A. degree from Boston University in 1926. She left again for China to continue her work as a missionary/teacher. In 1937 she returned to study theology at Biblical Seminary in New York City. She had a scholarship covering one-half the tuition, room and board. Mrs. W. H. Dietz of Chicago was helping her pay the other half of her expenses. 1. U.S. Naturalization Records Indexes, 1794-1995, “Index to Naturalization Petitions and Records of the U.S. District Court, 1906-1966, and the U.S. Circuit Court, 1906-1911, for the District of Massachusetts,” database on-line, Ancestry.com (http://www.Ancestry.com : accessed 15 Mar 2017). 2. California, Death Index,” California Death Index, 1940-1997,” database on-line, Ancestry.com (http://www.Ancestry.com : accessed 15 Mar 2017).